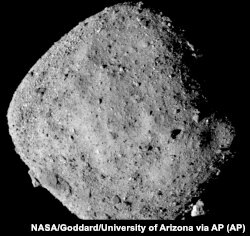 This November 16, 2018, image provide by NASA shows the asteroid Bennu. “It’s just a game of probabilities,” she said. Rebecca Ghent, another University of Toronto scientist, also worked on the study. She noted that we can see relatively few big craters on the Earth’s surface because the planet is more than 70 percent ocean. Also, the movement of large mountains of ice, otherwise known as glaciers, covered some of them. “Perhaps an asteroid family was broken up in the asteroid belt,” Mazrouei suggested. The space rocks then headed toward the Earth and moon, Ghent added. The planet then got a few more hits because it is a bigger target and has higher gravity. Other scientists are divided about the team’s research. Earth scientist Jay Melosh at Purdue University said he found the number of craters too small to prove any major point. But Harvard University’s Avi Loeb agreed with the team’s findings. “This demonstrates how arbitrary and fragile human life is,” he wrote. Seth Borenstein reported this story for the Associated Press. Pete Musto adapted it for VOA Learning English. Hai Do was the editor. We want to hear from you. How concerned about asteroid crashed are you? Write to us in the Comments Section or on our Facebook page.